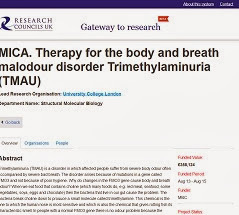 The "Therapy for the body and Breath malodour disorder Trimethylaminuria (TMAU)" has been posted by the UK Medical Research Council in the Research Councils Gateway To Research Site. You can also access this award information by going to the RCUK Gateway to Research site, and typing in the award code, MR/K015494/1. Please feel free to read all about it, including the Abstract, Technical Summary, and Planned Impact of this research as registered with the Medical Research Council, UK. Our scientists do not wish for sufferers to put themselves or their families in a difficult economic situation to donate to this fund. We have been announcing this grant since December 2012, and have been fundraising to support it with the Trinzyme Project. After discussing our fundraising efforts with our Scientific Advisor and Principal Investigator of this research project, Professor Elizabeth Shephard, I would like to relay what she and another scientist have told me. Our scientists do not wish for sufferers to put themselves or their families in a difficult economic situation to donate to this fund. In regards to this research project, the suffer's needs and well-being come first above all others. 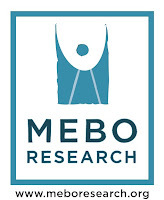 Having said this, it is MEBO's aim to fundraise for large donations, and we hope to launch an aggressive fundraising project in 2014. As we have been saying all along, the more we can delay involving investments from pharmaceuticals, the lower the cost to sufferers this therapeutic will be. If you are interested in being part of this fundraising project, please come with your ideas and volunteer work efforts so that we can organize a strong campaign. Needless to say, I know our whole international community is elated with excitement over this incredible opportunity to lead normal, healthy lives. It will take a few years for this therapeutic to come to fruition and to become available to sufferers, but it is well without our grasp in the immediate future. Now, all we need to do is to work hard to keep the cost down. Looking for translators to write this in multiple languages in facebook, the MEBO Spanish and Portuguese Blogs and in RareConnect. Please feel free to translate and post in your respective sites, or to copy and paste into any and all sites. 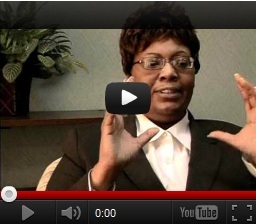 The point is to get this information out to the public. Thanks to everyone for their enthusiasm and support.